Ive been feeling pretty stressed the last few months as a few major life events have happened in a really short time. So I have started actively making time for myself and one of my favourite things to do is to take some time out with a pamper evening. 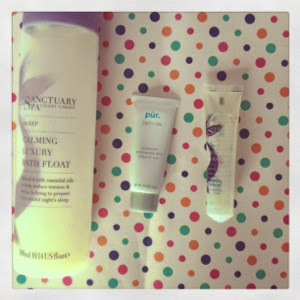 I began my pamper evening with a bath using the Sanctuary Sleep range Calming Luxury Bath Float. I am a massive fan of this range as It really does aid relaxation and smells divine while doing it. It has a texture like a body lotion and if you didn't read the label first you would be forgiven for thinking it was just that! Following on from this I next used also from the sanctuary sleep range restore body oil. I got this as part of sleep in a box and had been waiting until I was feeling especially stressed before using it. It had the same type of scent as the rest of the range but a little milder. I used the oil on my arms, legs, chest and neck. These are the areas I tend to hold tension in when I'm stressed out. The oil took a long time to dry into my skin maybe 2 1/2- 3 hours. I did feel more relaxed with it in but I was actively trying to relax. I found the most difference with this the next morning. It definitely deserves it's place in the sleep range wow I slept like a baby even this horrible muggy weather didn't wake me (which it has been) and I also woke up with beautifully soft skin. This is definitely a must have product for my future pamper evenings. Finally I used the pur dirty girl mud mask. This is a proper brown mud masque the likes of which I haven't used for a really long time. The mask went on really easily and was easy to wash off my hands which I always look out for, the directions said to leave it on for 5-20 mins. I had decided to leave it on for closer to the 20 minutes but it dried quickly and after about 12 minutes got so tight and uncomfortable that I had to sprint to the bathroom to wash it off. It came off really easily and there was instant relief from the tightness. My skin had that lovely freshness that you get from a masque, next morning I have a few little spots up after using it so I just wouldn't use when I have any event to be at. Overall I like the masque it didn't dry out my skin at all which can be a problem for me with mud masques. I had a lovely pamper evening with these products and finished it off with a movie night with my new husband. Bliss! What are your favourite products for a pamper night? Face in Products 5 THE FINAL! !